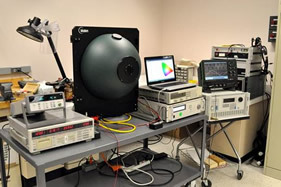 In late 2013, the Dolan Technology Center (DTC) received a new integrating sphere system equipped with a 20” sphere, matching software and an optically connected light measurement sensor known as a CCD Array Spectrometer. This spectrometer is also known within the industry as a spectrophotometer. It measures properties of light over a specific portion of the electromagnetic spectrum (e.g. visible light spectrum). This new integrating sphere system states that it can test lamps up to an equivalent 150 watt incandescent lamp. DTC’s previous capability in this area could only measure lumen output. 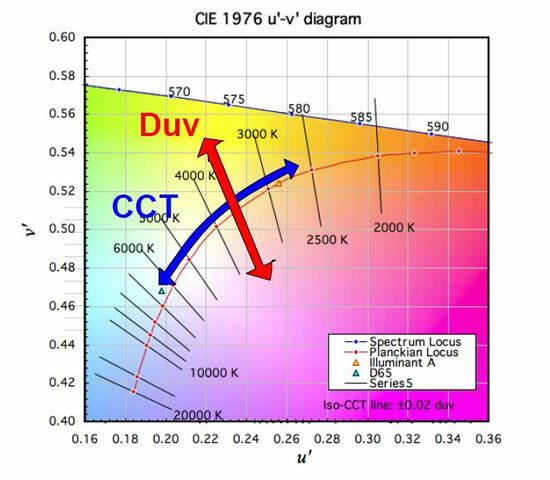 This new system gives DTC new abilities to measure a lamp’s color rendering capability, measure its color temperature (CCT) and chromaticity space, as well as its delta UV (DUV), which is the deviation in the variation of white light from the blackbody curve (Plankian locus) that is perpendicular to the variation or direction utilized for determining CCT. White light variations are often illustrated in two directions. The first direction is tied to the color temperature along the blackbody curve of a lamp under test. This direction follows this curve from a lower temperature (warm yellowish) white light to higher temperatures (cool bluish) white light. This direction is known as delta Temperature. The second direction is perpendicular to the blackbody curve and either has a negative value (pinkish hue) to a positive value (greenish hue) to the white light. A DUV of zero is when the measurement lies on the Plankian locus. The following diagram taken from a presentation made by Yoshi Ohno at the 2011 Council for Optical Radiation Measurements in Gaithersburg, MD on May 5, 2011, illustrates this point. 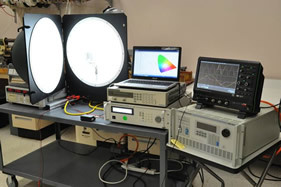 In addition to color and basic luminous properties, DTC plans to use this system to test LED lamp capabilities tied to efficiency and performance such as luminous efficacy of the source, power factor, current harmonics, dimming, compatibility, audible noise, light flicker, and light start time. For reliability, a few lamp stress tests are also planned that include a rapid cycle of power being applied and removed every two minutes for 15,000 cycles and testing for surge withstand whereby a standard 100 kHz ring wave is applied for 7 strikes at a 2.5kV level on a group of lamp samples. Internally, the results of this testing will be used to evaluate how AEP allocates its Energy Efficiency funds in the future via its LED lamp rebate program. Externally, DTC can use this system to evaluate new LED-based technologies and possibly test the efficiency of small individual photovoltaic (PV) cells.